Last week, SimpliVity, a leader in the hyperconverged infrastructure (HCI) space, announced that their OmniStack HCI solution will be available on Lenovo hardware. Prior to this announcement, the SimpliVity HCI solution could be deployed in two ways: by using the SimpliVity OmniCube appliances or by running SimpliVity OmniStack on Cisco UCS. This new announcement offers customers a wider choice of options. I’ll walk through the new solution below. The Simplivity OmniStack Hyperconverged Infrastructure solution is now available based on Lenovo hardware. The specific Lenovo hardware for this solution is the System x3650 M5 rackmount server. Lenovo leapt into enterprise customers’ awareness when they acquired both the ThinkPad line of laptops and the X Series line of servers from IBM a while back. SimpliVity OmniStack on Lenovo is truly a joint solution. There’s more to it than simply installing SimpliVity software on Lenovo servers. The key to SimpliVity’s success in HCI has been their OmniStack Data Virtualization Platform (DVP). This acts as an abstraction layer between the hypervisor and the storage hardware. The DVP does not run on the server’s CPU, but instead runs on an installed PCIe card (in an impressive mother-daughter board configuration) that comes with its own CPU resources. CPU cycles spent on deduplication and compression have no affect on the CPU available to the virtual machines running in an OmniStack environment. All deduplication and compression takes place before the data is written to storage. As SimpliVity likes to say, “the least expensive I/O is one that doesn’t need to be written”. It is the combination of the Lenovo hardware, the DVP, and the OmniStack software that make the combined HCI solution complete. 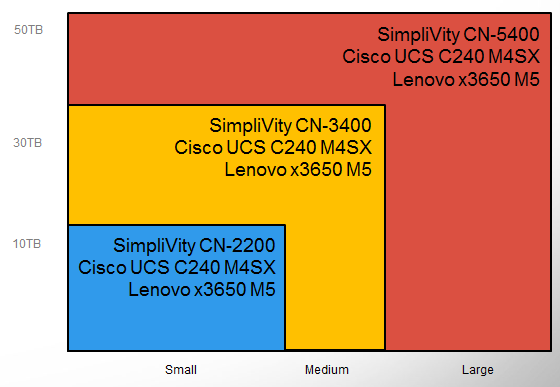 The specs for the Lenovo-based OmniStack are in the table below. “Effective Capacity” will vary by data set and is dependent on deduplication and compression ratios. The numbers used here are conservative estimates. In my experience, many customers have a lot of brand-loyalty to the servers they run in their environment. If you try to offer them a solution that uses servers that aren’t their preferred brand, you may hear something like: “We’re an all-<OurFavoriteServer> house.” I’ve seen this happen even in cases where the other solution was provably fuller-featured and less expensive. Now think like a converged (or hyperconverged) infrastructure vendor. The total solution you offer is more complex than this, but somewhere within it you likely have servers. Your success in selling to these server-brand loyalists will be limited if you can’t offer a version that works with their preferred brand. I would not be surprised if at some point in the future, SimpliVity moved to offering customers even more choice. Perhaps they’ll have a Hardware Compatibility List (HCL) and customers will be able to purchase any server on the HCL and be assured that the SimpliVity DVP and hyperconverged solution will be supported on it. The Lenovo OmniStack solution can be ordered now through select SimpliVity partners. It should be rolling out to all SimpliVity partners shortly. The new solution will start shipping in Q4 of this year. This entry was posted in SimpliVity and tagged Announcement, Hyperconverged, Lenovo, SimpliVity, Virtualization. Bookmark the permalink.